Lots of great teas come out of China, recognized by many in the professional tea world as the country in which tea drinking originated. Nestled in the southern part of that country is the Yunnan Province, renowned for some very fine Chinese teas. Bordering Tibet, Burma, the northern most part of Vietnam, Myanmar, and a bit of Laos, the Yunnan province is considered a buffer between China and Southeast Asia. The topography and climate range from mountainous and cool where it abuts the Tibetan plateau (some think this is the Shangri-La in James Milton’s Lost Horizons) to a spacious plain in the middle to a sub-tropical rainforest in the south. With about 30 different ethnic groups, this province is one of the most diverse parts of Asia and the world. What makes teas from this area of the world so special? For one thing, longevity. With experience comes wisdom and ability. The people growing these teas have a long history and tradition built up. The first tea trees were domesticated about 2,100 years ago. Three of these early trees still grow and are known as “The Three Ancient Tea Tree Kings” (the eldest at 1,700 years is Bada wild tree; the middle-aged at 1,000 years is the transitional Bangwei tree; and the “baby” at 800 years is the Nannou Mountain cultivated tree). Yunnan teas are grown at from 1,200 to 2,000 meters elevation, with temperatures ranging between 12 and 23 degrees Celsius and an annual rainfall between 1,000 and 2,000 mm. Tea was often grown as a tribute to high personages, and Yunnan teas were no exception. A mere 248 years ago as tea was becoming quite the rage in Europe and the “New World” (as it was called by those who never imagined two more continents existed between them and the Far East by the Western route), exporting began. It reached a peak in 1926-1936 with sales topping 5,000 tons (yes, tons) of tea being sold annually to Sichuan Province and Tibet, and an additional 500 tons annually to other countries. You can get Yunnan teas in cakes shaped into disks, compressed bricks, and loose leaf. The various types of Yunnan teas have distinctive colors and aromas, by which they are classified. Yunnan Pure Gold is a black tea and quite dark in color. Green Tuocha has a smoky, rich taste and yellowgreen color. There are also pu-erhs from this province that have a black or brownish red color and mellow, somewhat sweet flavor. There is even a Jasmine version, having the wonderful aroma of those lovely blossoms, and an orchid version, as well as smoked varieties. Some blooming teas use Yunnan leaves, too. Medical claims float around Yunnan teas like mists around a mountain peak. These include claims that some of the teas are good for dieting, others make you beautiful, and other improve your health overall, increasing strength and stimulating metabolic rate while controlling your cholesterol. One of my favorites is Golden Bi Luo (which some call Twisted Yunnan Gold, Hong Bi Luo, Yunnan Bi Luo). 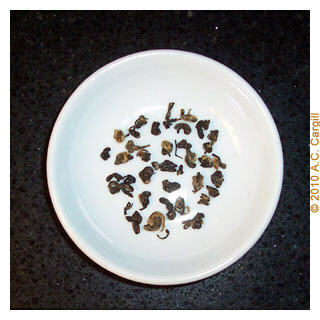 “Bi Luo” is a snail, which fits here since the tea leaves in their dried state are curled up like a little snail. A more affordable version is Golden Heaven Yunnan China Black Tea.